Welcome to the Malarkey website. 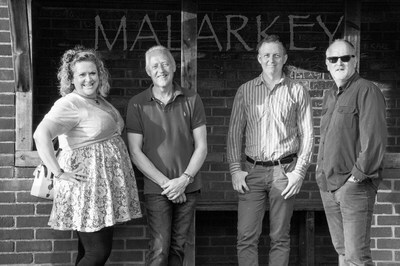 Malarkey is an experienced and versatile 4-piece covers band performing a varied cross-section of songs drawing on music from the 1960s to current chart material, covering artists from Adele to ZZ Top! Their styles cover the genres of Pop, Soul/Funk and Blues/Rock. They regularly perform in Pubs & Clubs and at Special Functions & Parties throughout South-East England. By prior arrangement they can also provide Acoustic and Jazz sets in various formats. Please view our Testimonials page to see feedback from some of our satisfied customers or to leave some of your own comments. We'd love to hear from you to understand your requirements and to discuss how we can help make your forthcoming event even more special!